UPDATE: 8/21/13: Claire is included in a new book by John Schlimm coming out in September: Stand Up! 75 Young Activists Who Rock the World, and How You Can Too! UPDATE: 6/1/13: You can listen to the podcast of Stacey’s interview with Claire here. 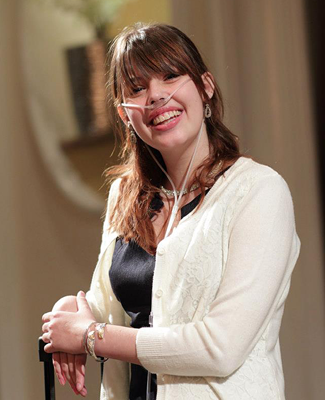 It’s not everyday a 15-year-old girl is honored for her wisdom, courage and “soaring spirit.” But Claire Wineland is unlike any typical teenage girl. This high school student, artist and budding comedian has cystic fibrosis, or CF. Because she was born with it, she says she doesn’t know what it’s like not to have it. She’s endured countless health problems in her short life, including almost thirty surgeries. “CF is a ripple effect disease. Mucus builds up in your lungs and goes everywhere and that causes cysts, which cause bacteria and that messes with your immune system, and then organs start to shut down. I have diabetes, chronic bowel obstruction, asthma…all these other things because of CF,” says Claire. Yet through it all, she has maintained a positive attitude and outlook far beyond her years. Three years ago, she almost died after a routine surgery led to lung failure. For two weeks she was in an induced coma but miraculously survived. She is now oxygen-dependent but says the experience gave her a new perspective on life. 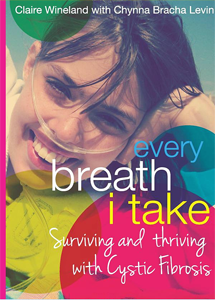 In just the last few years, Claire has written a book about living with CF called Every Breath I Take; she has countless YouTube videos; and she started a foundation to help other kids like her living with the disease called Claire’s Place. Claire says her ongoing curiosity about our life’s purpose is what leads her to do these things. 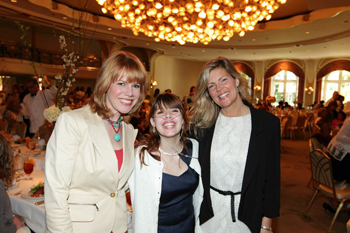 I had the opportunity to meet Claire when the Looking Beyond organization recognized her efforts with the “Soaring Spirit Award” at their 14th Annual Fundraising Luncheon held recently at the Beverly Hills Hotel. Co-founder Angella Nazarian says since it started, Looking Beyond has raised over two million dollars for local hospitals and programs that benefit disabled children’s needs. 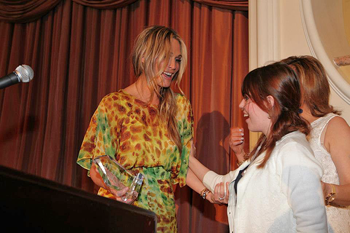 After a tear-filled introduction, actress, model and activist Molly Sims presented the award to Claire in front of a sold-out crowd of 450. For Claire, it was the first of what will be many more awards to come and yet another opportunity to tell her story and share what she’s learned. “I’m honored. It’s fun because it means that what I’m saying really matters to people,” she says. 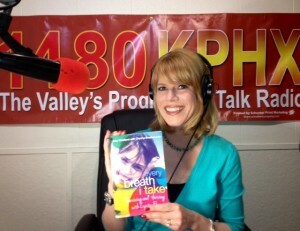 Stacey holds Claire Wineland’s book at 1480KPHX before recording her TWE Radio Interview.